It's about 'attitude' not 'preparation,' the president said of upcoming talks on Tuesday with North Korean leader Kim Jong Un in Singapore. WASHINGTON — President Donald Trump said Thursday that he doesn't need to study for his upcoming nuclear summit with North Korean leader Kim Jong Un. "I think I'm very well prepared. 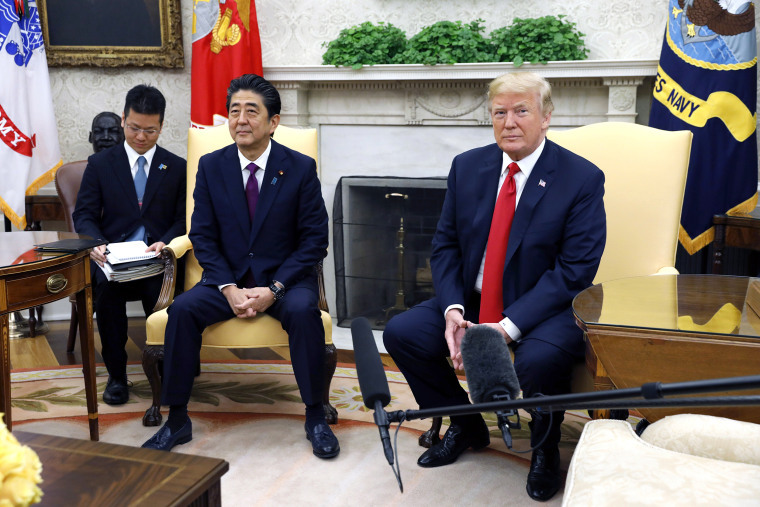 I don’t think I have to prepare very much," Trump told reporters at the White House Thursday as he posed for photos with Japanese Prime Minister Shinzo Abe. "This isn’t a question of preparation. It's a question of whether or not people want it to happen, and we'll know that very quickly." Trump is planning to travel to Canada on Friday for a two-day meeting with the Group of Seven industrial nations that is likely to focus heavily on trade issues before heading to Singapore for his historic sit-down with Kim. Later Thursday, ahead of his trip to Canada, the president held a joint press conference with Abe in which he told reporters that he is willing to normalize relations with North Korea, and would consider inviting Kim to the White House if the high-stakes summit is a success. "Yes, certainly if it goes well, I think that could happen," Trump said, adding that there could also additional meetings if the initial summit is productive. "I think there's potential to make a deal," he added. "I really believe Kim Jong Un wants to do something and he wants to see something incredible for the people of North Korea." However, the president said he has not removed the U.S. sanctions against North Korea going into the meeting and is willing to walk out of the talks if they aren't going well. "All I can say is I'm totally prepared to walk away," Trump said. "If you hear me saying we're going to use maximum pressure, you'll know the negotiation did not do well." Trump added that he is also prepared to ramp up sanctions on North Korea if the negotiations fall apart. One of the issues that is likely to be addressed at the summit aside from denuclearization is the return of Japanese citizens abducted by North Korea. Abe said he had an "in-depth and candid exchange" with Trump during their Thursday meeting, adding that he thinks the president "fully understands the situation." Trump's remarks regarding his casual readiness for the talks fit in with Trump's well-established disdain for prep time. He mocked his 2016 rival Hillary Clinton for taking time off the campaign trail to get ready for their debates and prefers briefing materials that fit on a single page. But he also said that he and Kim have both had plenty of time to think about the issues they will discuss as Trump pushes his North Korean counterpart to give up his nuclear weapons, possibly in exchange for relief from U.S. and international sanctions on Pyongyang. "It's about attitude. It's about willingness to get things done," Trump said. "But I think I've been preparing for this summit for a long time, as has the other side." Secretary of State Mike Pompeo downplayed questions regarding Trump's preparation, insisting at a White House briefing Thursday that the president's actions have moved the U.S. closer to real progress with North Korea than past administrations had. "The approach that President Trump is taking is fundamentally different. In the past, there has been months and months of detailed negotiations and they've gotten nowhere," he said, adding that Trump has had near-daily briefings for the summit. "This has already driven us to a place we have not been able to achieve before." Pompeo also downplayed comments made by Trump’s personal lawyer, Rudy Giuliani, earlier this week, that Kim had gotten "on his hands and knees and begged" for the summit after Trump abruptly canceled it last month. "I think it was a bit in jest," Pompeo said of those remarks. "We’re moving forward and focused on the serious issues...Rudy doesn’t speak for the administration when it comes to this negotiation." Trump and Kim are scheduled to meet at the Capella Hotel on Sentosa Island, a resort spot just off the coast of mainland Singapore, on Tuesday.